I am all about convenience and efficiency. I like to brush my teeth in the morning as my coffee is brewing. When Georgia won’t shut up about Kate Middleton’s latest hairstyle, I mentally create my week’s to-do list. After a workout, I take my sports bra into the shower with me to wash it (whatever, like you don’t have your own weird habits that you’re secretly convinced are brilliant). So when I have to rush out to work (because I’ve changed outfits twenty times and eventually decided on the one I started with), and forget to grab a yogurt for breakfast, I make it a goal to try and get my coffee and breakfast at the same place. You know, because otherwise it’s like, I get my coffee, and then when I stop at a deli I’m balancing my coffee in one hand, reaching through the crowd of fellow commuters for a Luna bar, all the while my handbag is swinging around wildly hitting everyone, and I’m trying to get out my wallet and whoops, that’s my birth control!, and then my coffee spills all over everything and I feel compelled to buy half a pound of cole slaw or something because I feel so bad for this deli that I am there. Nobody's perfect, but clearly oatmeal can be! Anyway back to the point: coffee AND breakfast in the same place is optimal. And that place means Starbucks, because getting my coffee there is just a sine qua non (I was looking online for synonyms for the word “necessity” and found that gem. Apparently it means “indispensable condition.” So sophisticated!) Fortunately, Starbucks seems to understand that it could make a lot more money from poor addicted souls like me and has come up with Perfect Oatmeal. In fact, Starbucks really must have my number because they called it “perfect,” and I am lured to perfection just as little fish are lured to this big scary one called the anglerfish that attracts its prey with this deceptive light hanging in front of its mouth. I don’t know why I know that, I really liked this one marine life book when I was little. 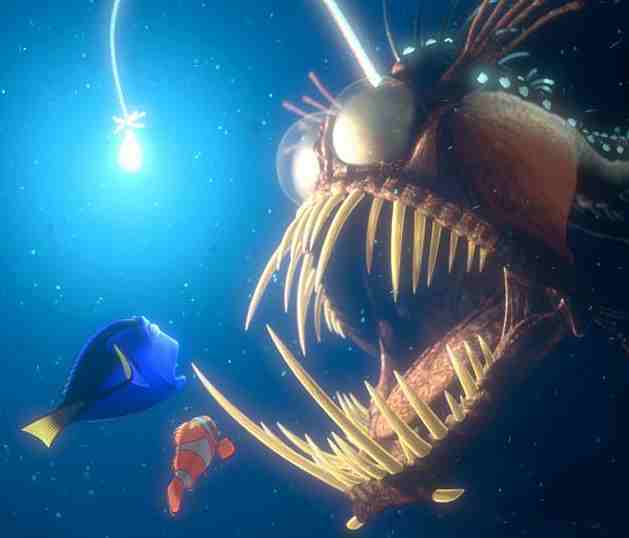 An anglerfish. You may recognize this one from his role in Finding Nemo. 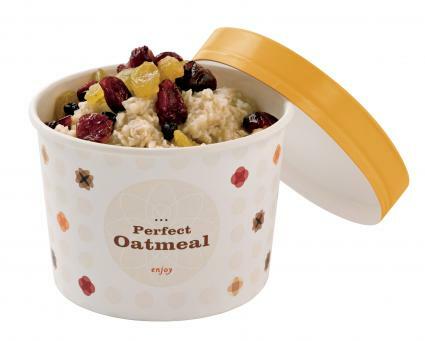 Starbucks Perfect Oatmeal really deserves its title, with 140 calories and the option of adding either brown sugar, dried fruit, or a nut medley for another 50-100 calories. And you should add one! Breakfast is the most important meal of the day, and the more satisfied you are, the more you will be able to actually maybe concentrate on your work and not waste the whole morning wondering whether or not Justin and Jessica are actually, really, TRULY engaged. When I was first informed about this website in the middle of October, I was instantly intrigued. After graduating college in 2009 and waitressing for a good year and half-two years while hitting the pavement everyday looking for what my friends and I would refer to as a “big girl job” I didn’t really worry about what I was consuming because I would run around a restaurant 5 days a week, 5-9 hours a day and it wasn’t really a huge concern. However, once I got my first “big girl job” in October, I found myself wanting to snack because I was bored sitting at my desk. A good friend of mine sent me this link and I was instantly addicted. Now when I go shopping every two weeks for snacks, soup, Diet Coke, and cat food for my fatty cat (who needs a skinnycat blog), I tend to look for low-calorie goodness or ways I can make my classic choices a little bit lighter. While I was in my hometown of Poughquag I ventured into a little deli which housed a shelf full of gluten-free items. On that shelf I stopped when I got to a product called PopCorners. “The New Shape Of Popcorn,” the catchy phrase underneath the title, states that they take a new shape. 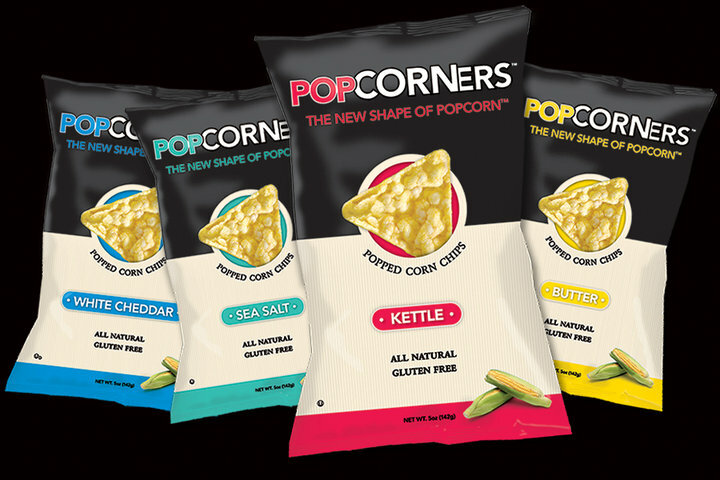 These awesome little triangles are delicious and come in 5 flavors: sea salt, white cheddar, kettle corn, cheesy jalapeno, and butter. I picked up a sandwich and a bag of the butter flavored PopCorners and set out for my next doctor’s appointment. To my amazment these “chips” taste just like a bag full of movie theater butter popcorn…yumm…cannot beat that! So to all my fellow Skinnyoffice-rs out there, give ’em a try and let me know what you think! Well, I officially lost my mind last night. I was at a wonderful event for the Make-a-Wish Foundation, and if I was capable of behaving like a normal person, the whole night could’ve gone very smoothly and I wouldn’t be sitting here blogging at 6:41am. But of course that didn’t happen. It all started when I walked in and was greeted with a glass of champagne and a tray of mini crab cakes. 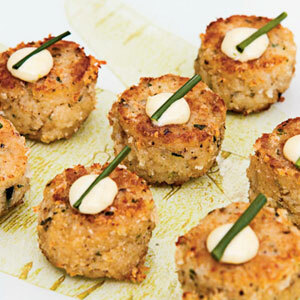 Anyone who shares my maniacal lust for shellfish knows that it’s impossible to say no to crab cakes, and blinded by my crustacean love, I overlooked the fact that each of these little gems has more calories than I like to eat in an entire day, stealthily slipped 5 deep-fried monsters into my hand, and headed over to the silent auction table. I ate 20 times this. Whoops. 100 crab cakes and two grand prizes later, I arrived home feeling a bit guilty about my overall overindulgence. 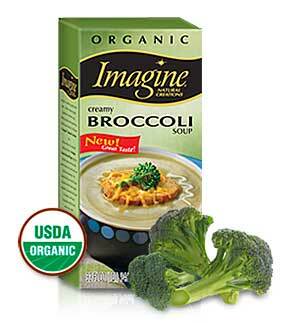 In order to redeem myself, the only thing I will be indulging in today is Imagine Organic Creamy Broccoli Soup. With only 60 calories and 1.5 grams of fat per cup, I can eat an entire box of this soup and still not come close (calorie wise) to the Crab Cake Disaster of 2011. I really thought this soup would be watery– I mean, the first ingredient listed is filtered water– but Imagine broccoli soup is so creamy and smooth it actually tastes like silk. Elena and I first tried this soup yesterday at the office, and we spent about 15 minutes discussing its virtues. If you don’t have a microwave at work this isn’t the option for you, but if you do, it only takes two minutes to heat up and it’s a great snack for the cold weather. Also, the soup only costs about $5 a box so my credit card will be happy to get a break today! If anyone else is feeling as generous as I was last night, you can click here to read more about or donate to Make-a-Wish. Thank god they don’t have any online auctions…I have enough problems with Shopbop. I’m a salt loving girl, what can I say. Most days when the clock strikes 3 and I’m on my last leg at work, all I can think about is ripping through a bag of chips. 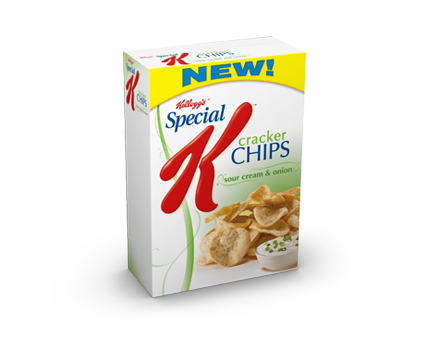 Recently when one of my cravings came over me, I ran over to CVS expecting to buy fattening chips (not my finest hour, but when a girl is desperate…) but to my delight I came across Special K Sour Cream & Onion Chips. For 27 chips it’s only 110 calories and 2.5g of fat! This cannot be a more perfect snack for the busy SkinnyOffice girl. Special K can do no wrong. You can buy these chips (which also come in sea salt flavor) pretty much anywhere and they are actually really tasty. I know that you may be thinking, yeah they probably taste like cardboard, but I swear it’s like dipping your favorite chips into real sour cream and onion dip! I now make sure to keep a box on hand at my desk when the salt monster rears its head, so that I don’t gain all the calories I desperately worked off in spin class that morning. If only these were available while I was in college, I would have definitely saved myself some time at the gym as well as some weight! I never really got into the whole soy craze. And that’s an understatement–what I really mean is, whenever anybody says the word “soy” to me I instantly tune out of the conversation (unless we are talking about soy sauce, in which case I will perk up since maybe dinner plans at Haru are about to be made). I don’t like that I don’t know what this “soy” substance really is and how it gets into so many things. I even once had a nightmare that I accidentally put soy milk instead of skim milk in my coffee, and now at Starbucks I have to obsessively double-check the label of the milk container I use, which really hinders my attempt to look like I’m important and in a rush. Aside from the mild OCD compulsion, I very much enjoy this attitude towards soy that I have cultivated. I like rolling my eyes whenever somebody tries to tell me about the latest soy creation they have found, and I especially have fun judging people who order soy lattes in Starbucks. (If that’s you, don’t be offended. I order “skinny” lattes, so I’m not really one to talk.) So when somebody suggested these soy crisps to me, I wasn’t really into it; instead I had a pleasant time looking skeptical and contemptuous. But then I tried one light, perfectly crispy, delightfully flavored Glenny’s soy crisp and my world changed. A little bit. Nobody conjures up the taste of the Mediterranean in a soy crisp like Glenny's. 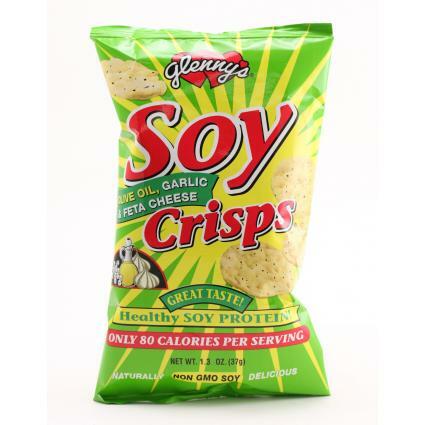 There may be some other soy crisp brands out there, but Glenny’s is the only one that I’ve found that has so many flavors to choose from, and only 80 calories per serving/140 calories per bag. They also have the perfect amount of seasoning, unlike anything I have ever attempted to make in the kitchen. If you’re in the mood for something savory, go for the Creamy Ranch, Cheddar, or Olive Oil, Garlic, & Feta; for something sweet, the Caramel or Apple Cinnamon. Apparently soy also has some protein in it, so these crisps aren’t just empty calories, either–they actually will help fill you up so you can really focus on your evening plans. Or like, work or whatever. My point is that you, my SkinnyFriend, don’t have to love soy, know anything about it, or even be aware of its existence in order to LOVE Glenny’s soy crisps. I still hate soy but I love these soy crisps, and you can too–it turns out being a hypocrite about soy is the most fun of all!